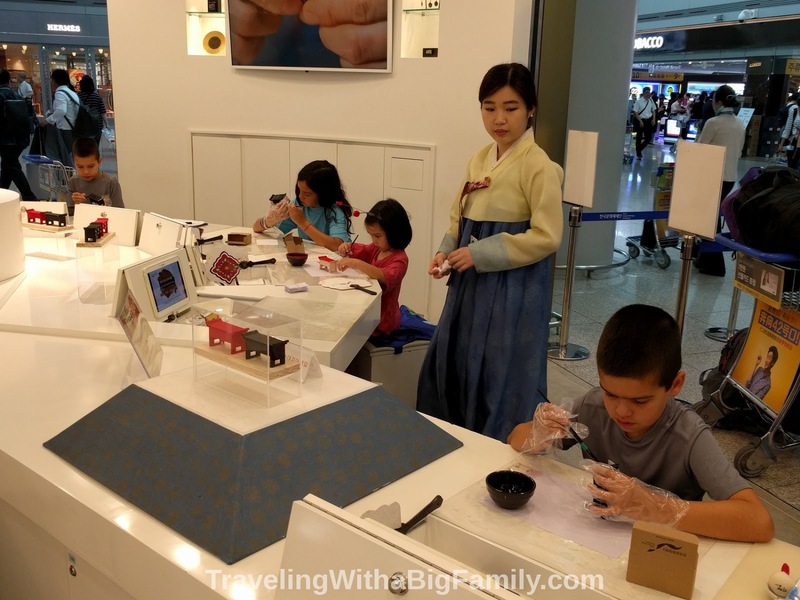 We took advantage of this absurd "layover loophole" to gain what was essentially a free night in South Korea (The Republic of Korea), both while going to Thailand, and again on the return trip from Thailand. I could barely believe my eyes: tickets on the same airline, and same travel day and time, were three times more expensive for the first leg of the trip, than for both legs of the trip. It would have cost 300% more to fly from the US to South Korea, than to fly to Thailand with a stop in South Korea, even though Thailand was an additional 2,300 miles (3,700 km) away! Couldn't we see at least a little of South Korea, maybe even have a great overnight experience, with 17 hours to spare? And it would add nothing to our travel cost, other than what we spent on transportation, food, or lodging while stopped in South Korea. I knew that some countries require visas in order to let you leave the airport even for an hour, so I checked first and confirmed, travelers with US passports are able to enter and exit the airport in Seoul while waiting for a layover. Now of course, 17 hours in South Korea doesn't leave a great deal of time to see the place, I'll definitely grant you that! And I couldn't arrange it for longer - I tried. With a stay of more than 24 hours, the airline breaks it up into multiple journeys and you may as well stay a week as try to make a free layover last for 2 nights. 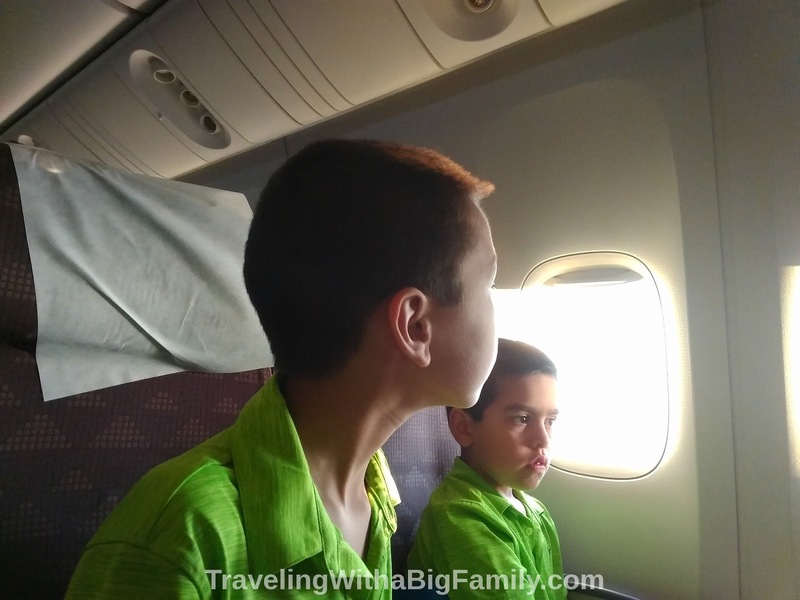 On a long, round-the-world sort of trip, it may be very helpful for kids (and parents!) to be able to stop and rest somewhere along the way, even if it's just for one night. Our trip from the U.S. to Thailand was going to be very long, and would involve staying awake well over 24 hours for those of us (such as my wife, my oldest daughter, and myself) who usually find it impossible to actually get any sleep on an airplane. It was "only" a 15-hour flight, but once you add an hour for getting up and showering, and another hour for breakfast and last-minute packing ("Where's my Minnie Mouse?! "), plus an hour to get to the airport, then the recommended 3 hours to process through ticketing and security, plus an hour to exit the airport at your destination, that 15-hour flight really means a 22-hour travel day, at a minimum. After that, you'll still have to navigate your way beyond the airport exit to wherever you're headed (+1 hour), and then think about dinner (+1 hour) and six showers (+1 hour), and then you'll have been awake 25 hours and to say the least, it probably won't be the absolute best time for sightseeing at that point. Some passengers stay awake, and they are chatting or they leave their TV screens, laptops, tablets, and reading lights on until way too late. Evening meal is served way too late at night (like 10pm, right when I am starting to think about the possibility of sleep). Person next to you needs to get past you, to use the restroom repeatedly. At some point before breakfast, someone opens up their window and lets harsh sunlight fill the cabin. Even if it's just for 3 seconds, that tells my brain "Get up Get up Get up!" even if my brain thinks its should be 2am. Even when none of those things happen, I've got kids on the plane and feel I have to keep aware of where they are, and make sure their arms, legs, and noggins aren't sticking out into the aisle where they might get bonked by a coffee cart. If I do manage to sleep for 6 or 7 minutes, immediately all the lights come on and breakfast is served way too early (like 2 or 3 hours before landing - by that point, I'd rather they just let us sleep until touchdown!). So for me, I usually just assume I'll be awake for the entire flight, no matter how many hours in a row that will involve. When traveling on a full day's journey with a big family, being able to just get off the plane and away from planes and airports for a long break, and doing anything other than flying again immediately, is a great chance to get refreshed and avert exhaustion. By booking a room, you can make your "Layover Country" a "Stopover Country." Since the only arrival time that gave us a chance at a 17-hour layover was one that occurred in the late afternoon, we had to choose between attempting to sleep on the plane (impossible), then staying awake for the entire 17-hour stop in South Korea, or booking a room large enough for a big family. Nighttime in Seoul was going to feel like daytime to our bodies and brains, due to our jetlagged sense of time, so maybe, I thought, just maybe, we could just stay awake the whole time, and use that time for exploring! At first, it felt doable. I pictured that we'd have a lot of fun touring Seoul late at night; it's a huge city, vibrant and active, and considered very safe. But the first downside I saw was that every single historical and archaeological attraction would be closing for the day, before we even got halfway to Seoul. Turns out 5pm is a very common closing time for attractions in Seoul. Almost nothing historical was going to be open at night, and many of those areas (palaces and such) are closed off behind high walls so I wasn't sure we'd even be able to catch a glimpse of them after closing, from the street. But, still, I figured we could shop and eat and walk around and tour the city, right? However, then it hit me that eventually, maybe at 12am, maybe at 2am, almost all activity around us would come to a stop. Most of the city would go home and go to sleep. And we'd be out and about - but where, exactly? In a 24-hour restaurant? On a park bench? Even if it felt like the middle of the day to our jetlagged brains, when the kids saw everyone was gone and the city was becoming quiet and empty, they'd want a place to go to bed. A local time of midnight would override our brains' instructions that it was really only noontime for us. 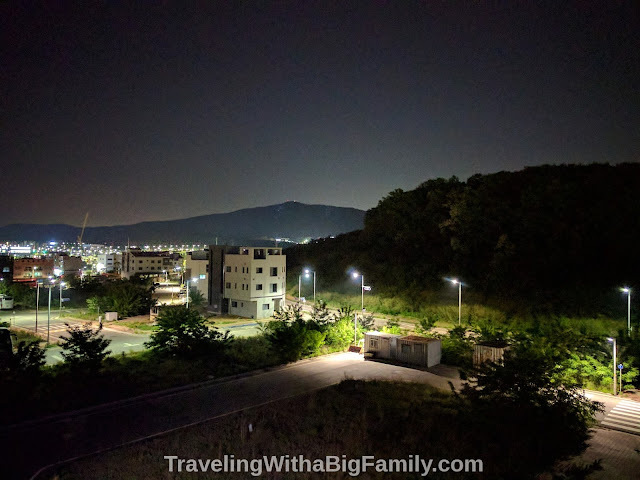 My wife and I decided that trying to stay awake all night in Seoul, with small children, would make the kids feel unsafe and unhappy, once midnight rolled around. That's just one difference between traveling as a couple vs. traveling with children. When we traveled as a couple, there were quite a few occasions when we'd find ourselves saying, "Well, we can sleep on the bus, then when we arrive to that small town at 3am, we'll just have to hang out downtown till the next bus leaves at 6am." No problem for a young couple. But crazy hours like that can make for a miserable experience for kids. Sometimes, with kids, you just need a hotel room because the local time is midnight, even if you shouldn't logically need one yet. So we decided we would want a hotel room. Seoul would have been awesome to see, but getting there from Yeongjong Island, where Incheon International Airport is located, was going to take way too much of our limited time in-country. We were arriving in the late afternoon on a weekday. This meant departing the airport at rush hour. The best estimate we could get for travel time was 2 hours to Seoul. At off-peak hours, it can be done in 60 to 70 minutes (if you know exactly where you're going and how to get there, which we didn't). Considering the early-morning departure time for our flight out the next day, we would need to make our return trip smack in the middle of morning rush hour. We were advised that we had better allow a full 2 hours for transit between Seoul and Incheon's airport the next day. I just couldn't see spending 4 out of 17 hours, 24% of our time in South Korea, in transit. Riding public transportation or in a big car for 4 hours roundtrip isn't that much different than riding in an airplane for 4 hours, as far as how exhausting it is for kids. It would have been doable, but it seemed like a lot of effort for a very short visit. Plus, it felt absurd that while trying to stop and rest (because we still had 5 hours left to fly to Bangkok), we would instead spend 4 of our rest hours on a bus or train, getting to and from Seoul. So on our way to Thailand, instead of heading to Seoul, our stay was in a multi-story hotel in Incheon's Unseo-dong area, about 5 minutes from the airport. 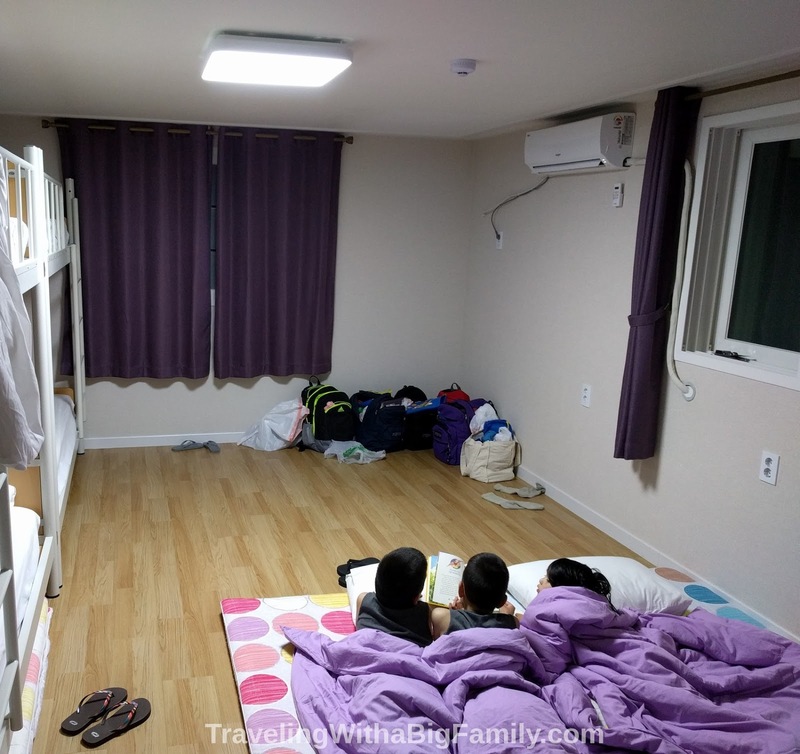 On the way back, we stayed in a hanok home located a little further away, but still on Yeongjong Island, and described in this post. #7: Look for a "Family Room"
With that amount of floor space, and using extra blankets the host had mentioned, we could have easily fit all 6 of us on the floor. I'd say about 8 people could have used the floor area with no problem; so the room would fit up to 12 in a pinch. We also had a private bathroom, with a hot shower and a toilet that contained more function buttons than I ever thought possible. While the hotel owner was showing the family around the room, and explaining how to work the air conditioner and so on, I poked my head into the bathroom, in case the shower needed explanation. When I saw the toilet, I felt instantly bewildered. I literally had to ask the hotel owner how to flush. She giggled (tee-hee-hee!, hand over mouth) and assumed I was joking. Feeling like a time traveler from the Old West, I had to admit to her that even though I had just studied all the options pretty carefully, I really had no idea which of those buttons would make it flush. "Ours at home just have one button," I said, by way of explanation. She tried not to show it, but I imagine she was slightly horrified at the thought of a one-button toilet. Besides, I told her, I really didn't want to just guess, for fear that I'd accidentally engage the ejector seat. After a 3-minute explanation of how to work the toilet (which had buttons for hot water jets, cool water jets, weak water, strong water, warm air, half a dozen additional buttons, and I'm not sure but there was probably a fax machine down there somewhere), she also explained the numerous rules about which parts of the hotel are considered "inside" and which parts are "outside." Here's a hint: you can't tell which is which just because you have entered the building from the street, or just because there's a roof over your head. She showed us where to change our street shoes into the provided indoor shoes. The rules about where to stand while changing shoes, and whether it's okay for the wrong shoe to touch the wrong spot (to balance on an "inside shoe" on the "outside shoe" changing area - all of which is inside the building's second floor hallway!) for even a second, are also very important to the host. A do-it-yourself breakfast kit with eggs, toast, and jelly was also included, as was free airport transfer, provided by the hotel owner's father. It was a great hotel stay and they made us feel like family. Or, for a bit of the flavor of the historical, traditional way of living in South Korea, book a stay in a hanok home. We stayed in one of those on our second pass through South Korea, and it was awesome! Our family loved it. More on that, and how to find one big enough for a big family, in this prior post. When staying in South Korea it is helpful - actually, a necessity - to have some Won (local currency) on your person. We encountered several situations, in both of our visits to South Korea, in which the only possible way to pay for a service or a purchase was in Won (neither debit cards nor credit cards were accepted, in some places and situations). For instance, nearly every meal we ate had to be paid for with Won. When we wanted to make a small souvenir purchase in one spot, the only way to pay with was Won. We booked a hotel room online from inside the U.S., and were sent a confirmation email directing us to make payment in person, in South Korea, in Won (not in Dollars, and not with a plastic card). And, if you've become accustomed to prices in other Southeast Asian countries, don't forget that prices will be a quite a bit higher in South Korea. Take advantage of the opportunity to have a memorable meal or two in the layover country. We ate Korean food in Thailand one time too, but it was awesome to be able to get off the plane and have both dinner and breakfast the next morning in South Korea. On our first stop in Incheon, our host suggested several kinds of take-out, as it was getting pretty late and she could see that we were all exhausted after a sleepless night on the plane. We had fried chicken delivered by motorcycle, and it was just spicy enough and came with just enough Korean accompaniments to make it an exotic experience. We didn't think to order drinks, but had a chuckle when a huge family meal was delivered with a single, warm, 6-ounce can of Coca Cola. The hotel owner supplemented this with free bottled water from the kitchen. Due to the fog of jetlag, on our first pass through Incheon, I woke up two hours earlier than necessary the next day. That's one of the things that I hate about my brain: whenever I really, truly, need a certain amount of sleep, my brain is almost always going to jolt me awake 2 or 3 hours earlier than necessary, just to be a jerk! So while the family slumbered, I took advantage of the opportunity to roam the still-dark island on foot at 430am. I saw people heading off to work, with occasional traffic here and there, but mostly the streets were quiet. Most businesses were closed, but eventually (after walking around about 15 or 20 minutes) I passed a diner where I saw a woman rolling out some sort of dough, and busily preparing food in steaming pots. I poked my head in and said Good Morning, wondering if it was even open yet. She greeted me in Korean, and stepped to the cash register, which I took as a sign that she was ready to take my order. She asked me something that I couldn't make out (my Korean being limited to about 3 words). She suggested, by pointing, a hot bowl of noodles and something else that looked yummy but mysterious to me. I sat at the counter and ate every bite of what she had suggested. I still don't know what it was. But it was wonderful, and a memorable breakfast, just sitting there alone in the dark city and watching it come to life. I brought back some take-out for the family to try, once they crawled out of bed. We were delighted with Incheon International Airport and its attractions. Considered one of the best and cleanest airports in the world, it can be an actually enjoyable experience to spend some time there. There's a bewildering number of things to do at the airport, at all price levels. We ended up wishing we had more time to just explore what the airport had to offer. There is a cultural museum on one floor, and we were disappointed we couldn't include it in our plans. We stopped at an information desk to ask for directions, and before answering, the agent asked to see one of our plane tickets. "No," she said. "You don't have time for that." I was unconvinced, but when she described the process involved in traveling to that different departure hall by free train, getting upstairs, touring it, and then getting back by train, I agreed with her - we'd very likely miss our flight to Bangkok, just to see a museum. But on her recommendation, we made time to stop and participate in a free children's activity nearby. 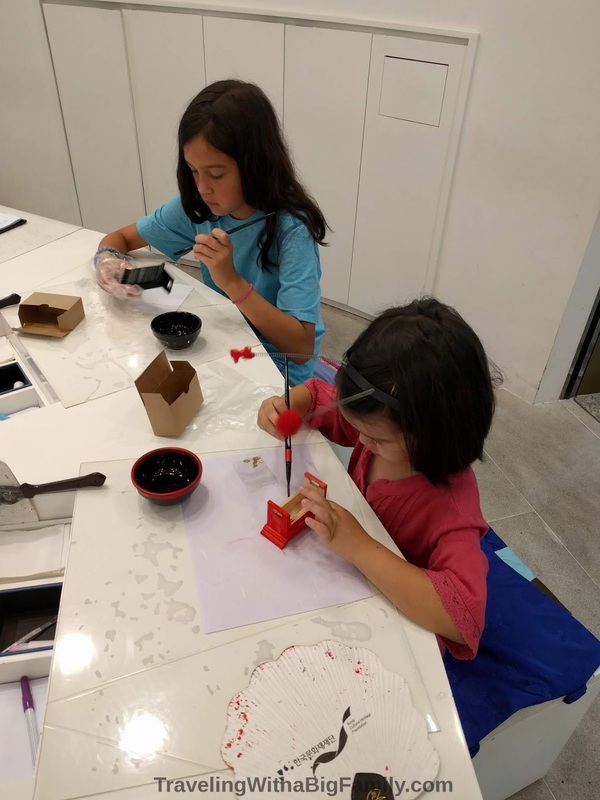 The airport offers several choices of free cultural activities of various types, and one of them was located just 10 steps away from that information desk. The one that was in our departure hall involved painting a miniature wooden model of a traditional type of Korean furniture. The kids enjoyed focusing on this small work of art, and ended up owning a free souvenir to take home. If you will not be leaving the airport independently, you can also sign up online for free tours of Incheon or Seoul. They have several options for tours, ranging from one hour, to a couple of hours, to a half-day. We tried to arrange one of those, but due to our restricted times (the only way we could spend the night in South Korea was to arrive in the late afternoon, and depart early in the morning), none of the tours were available to fit our schedule. They stopped going out before we arrived, and they didn't start back up the next day until after we were gone. Incheon Aiprort Maglev, Lotte Mart & Eurwangni Beach. Cheonggyecheon Stream & Jogyesa Temple. If you're truly strapped for time there's even a 1-hour tour that only hits one of Incheon's nearby beaches. From what I've researched, the tour operators are fast and reliable, and they keep to the schedule to make sure no one misses a flight. They fairly well rush you onto the bus, grins beaming, "Let's go! Let's go!" then they make sure you don't get lost, and get you back to the airport at the promised hour, every time. And as far as the price, well, you can't beat "free." While planning a stopover in South Korea, I researched the prices for 6 people to get a private tour guide and minibus to take a 4-hour tour to some of those destinations in Seoul. Compared to those prices for a private tour arranged independently, getting a tour like that for free is an almost unbelievably fantastic value. The Incheon International Airport also offers a free rest area, if your layover is too short to get to a nearby hotel. If I was going to stay in South Korea for less than 7 hours, I'd consider staying at the airport, in conjunction with a 4-hour tour, if the schedule lined up right. Many families opt to just hit the free couches, pile their luggage around their feet, and try to catch a nap. These aren't your standard airport lounge seats: they are actually intentionally designed for sleep. Still, I would've found this a difficult environment in which to sleep, as there are lights on all day and night, and it never really gets peaceful or quiet at an airport. Plus, there's the total lack of privacy (Can you sleep when 100 people can see you?). But if you only have a few hours here, and haven't slept on the plane, then the free rest couches would be a good bet. The airport also has indoor play areas for kids, and showers, plus lots of places to eat and other activities, so being stuck at Seoul's airport in Incheon is more of an opportunity than it would seem.